After a half-hour wait, I finally made it through the door (hurrah!) and discovered why it is that there’s always a line. The place is tiny! 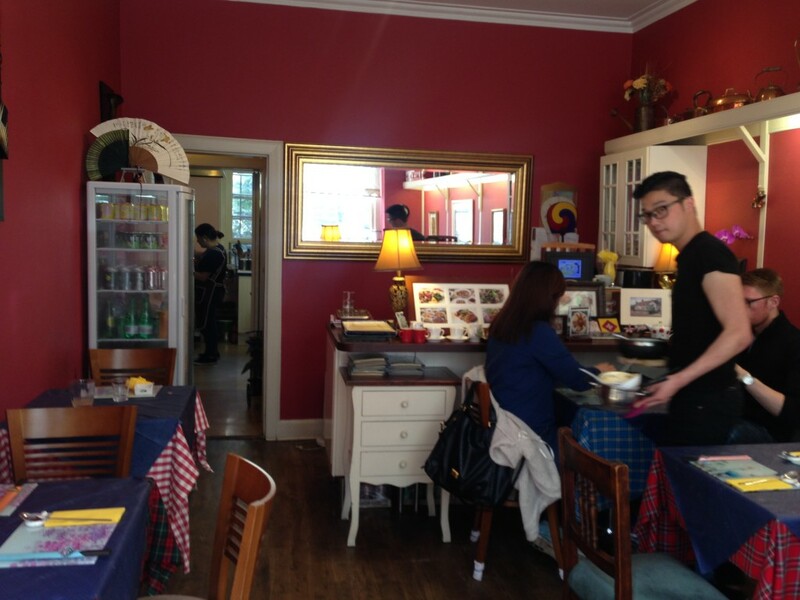 It basically consists of the few tables in this space and two tables in an even smaller second room. It’s a family-run operation here — the waiter in the glasses is the son of the owners and that’s his mom (Mrs. Kim) in the kitchen making our food. By New York Korean restaurant standards, the menu was fairly limited though it covered all the compulsories — soups and stews, bibimbap (of course), Korean pancakes, noodles, galbi and bulgogi. 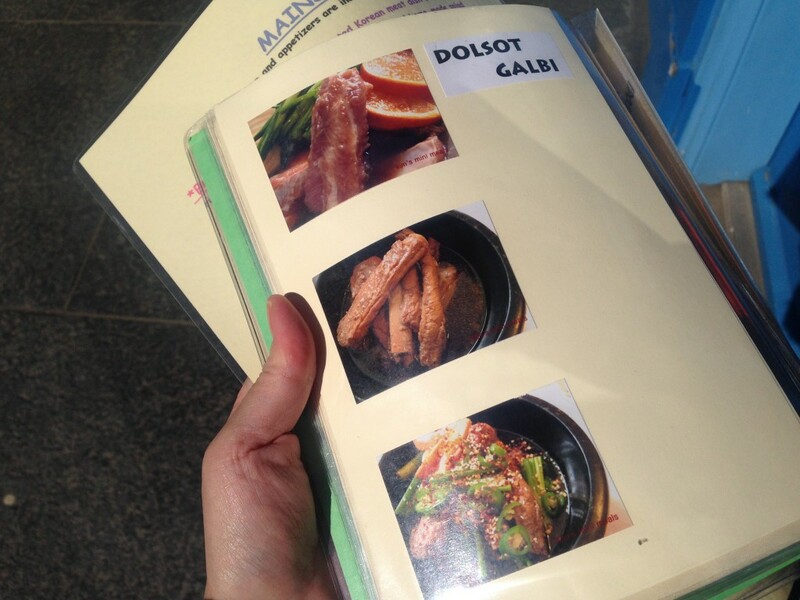 It even had a handy picture-packed menu so people could see what the dishes actually are. If you’re coming in the evening and hankering for a glass of wine or something strong, it’s BYOB. 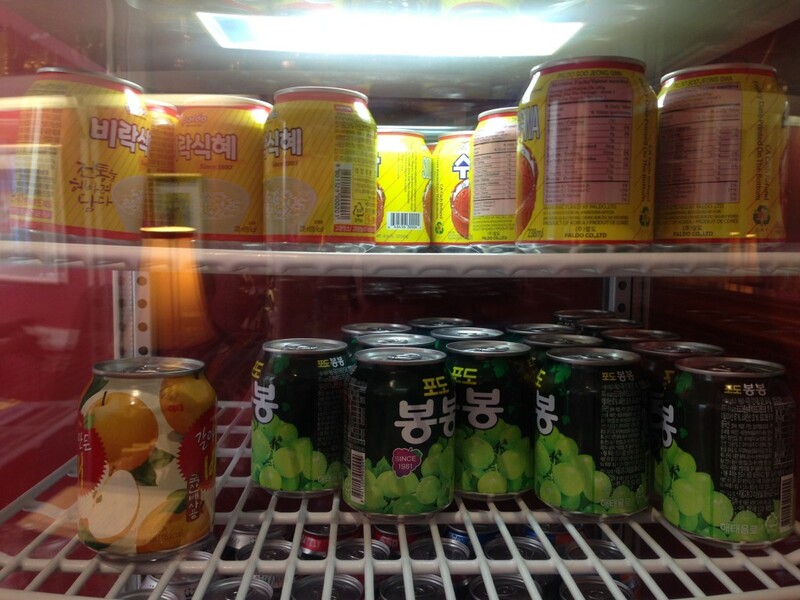 Otherwise, there’s hot tea and a fridge full of Korean sodas and soft drinks to choose from. The pear and apple were enticing but having never tried Korean “rice punch” (£1.50) I decided to give it a shot. 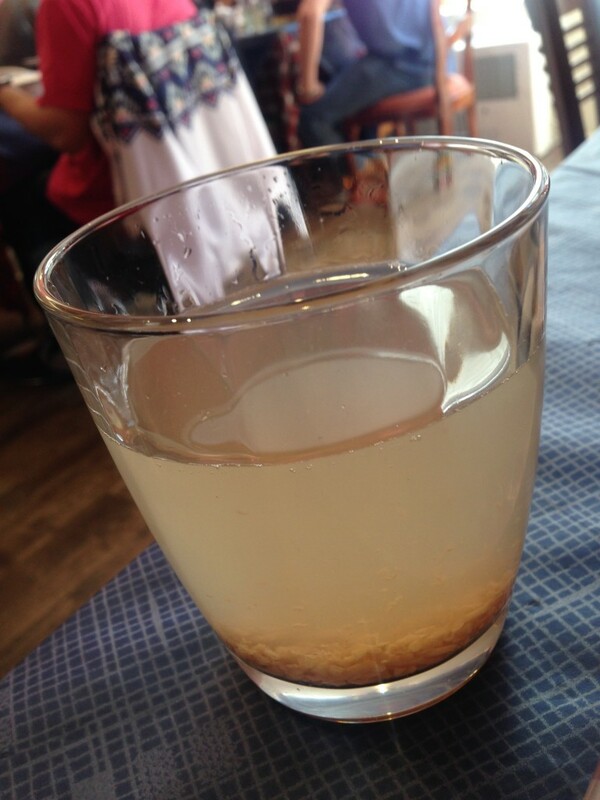 This little glass of murky liquid came with a swirling vortex of soft rice bits when the waiter set it down. Just lightly sweet and filled with the flavor of toasted rice, the drink was delicious. Since I had been craving something warm and spicy, my choice was obvious — soondubu jjigae (£8), a bright red stew featuring silky tofu and vegetables in a spicy peppery broth. 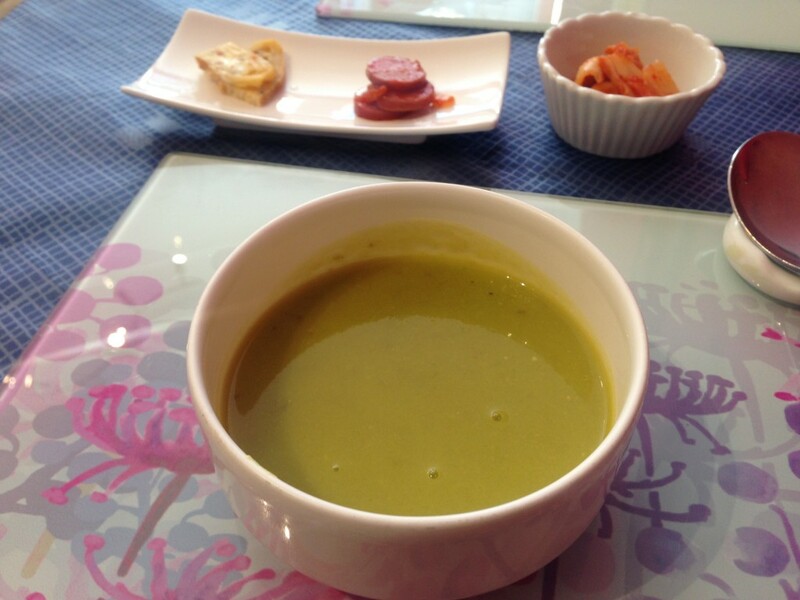 First though, this appeared — complimentary green bean soup and a few little bits of Korean banchan (side dishes). The soup was creamy but light and not sweet at all, which was lovely. (It reminded me of my mother’s comforting green bean soup.) The kimchi (homemade) and sliced fried sausage were tasty but what I adored was the little slivers of scrambled fried egg. Talk about comfort food. 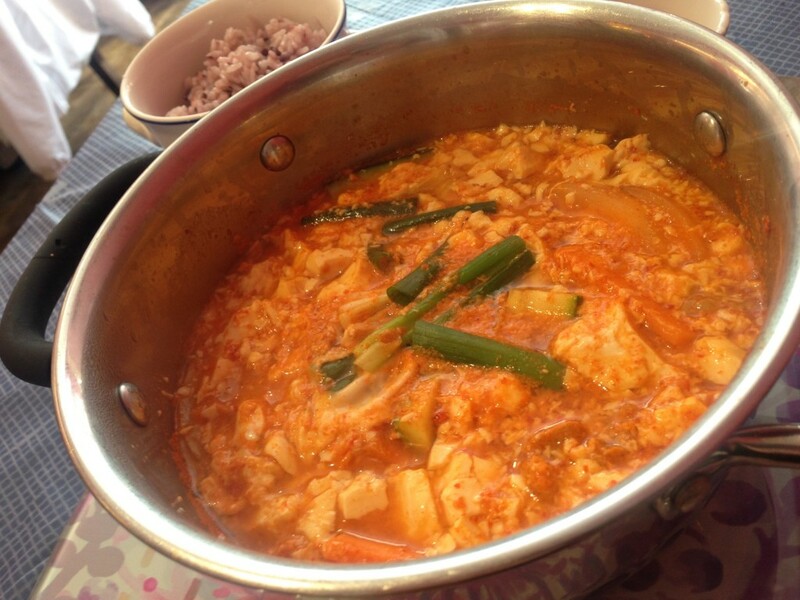 By the time my soondubu jjigae (pictured up top) arrived, I was ready — and what a treat it was. First of all, the bowl was gigantic. Secondly, the flavors were terrific. It wasn’t as fiery as the versions in New York City’s Koreatown that I’m used to (and I had requested the spicy, as opposed to non-spicy, version) but the melange of flavors that make this dish great were all there — the Korean peppers, earthy mushroom nuances, a light sweetness from the vegetables. And the tofu, as always, was a lovely foil and sponge, just soaking everything around it right up. At Kim’s, you can get soondubu on its own, with seafood or with pork. I chose the pork and it was fine — nice to hit a meaty bit every so often. But it would be perfectly lovely without, too. As I wrapped up my meal, I saw the tables all around me just filled with large plates of fried glass noodles, stone bowls of bibimbap and contented faces all around. 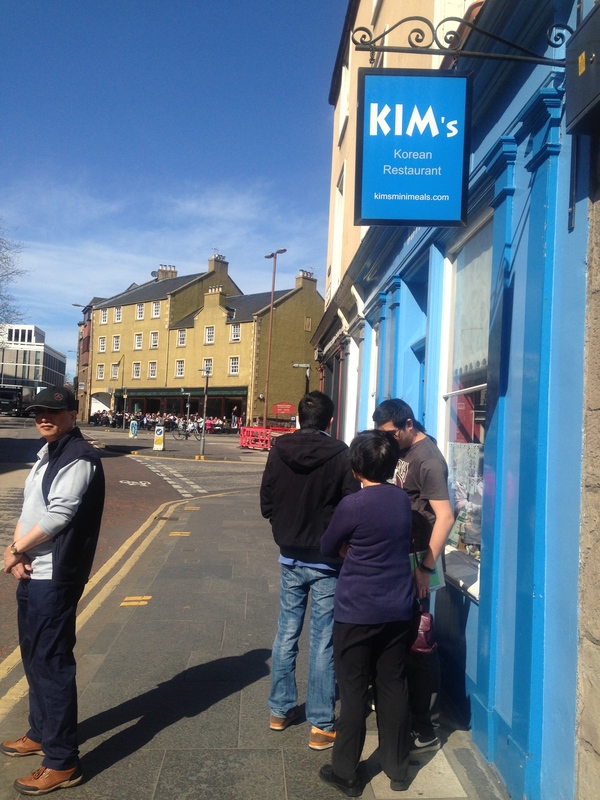 Dorset Boy may be right that Edinburgh is far from the Asian gastronomic hub I hoped it might be. But you know, if you just keep your eyes peeled, it turns out it’s not too hard to find a gem.